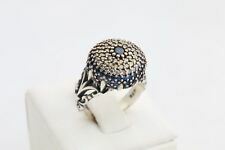 Turkish Handmade Evil Eye Round Sapphire Topaz 925 Sterling Silver Ring Size 6. I t is perfect example of "Turkish" handcraft production. The stones are SAPPHIRE and TOPAZ. Material is 925 sterling silver and bronze. It is perfect example of "Turkish" handcraft production. Material is 925 Sterling Silver and bronze. Designed : Turkish Authentic Jewelry Art from famous Grandbazaar Istanbul. Stone : Sapphire and Topaz. Material : 925 K Sterling Silver. Stone Color : Blue. Stone : Black Zircon. Designed : Turkish Authentic Jewelry Art from famous Grandbazaar Istanbul. Material : 925 K Sterling Silver. Stone Color : Black.